Since the Second World War, there have been three instances of a divided partisan Congress. The first was the six-year stretch from 1981 to 1987, when Republicans held the Senate but not the House. Then, following the April 2001 party defection of Republican Senator Jim Jeffords, for most of the 107th Congress Republicans ran the House but shared power with Senate Democrats. And now there is the 112th Congress, featuring a Republican House majority and a Democratic Senate majority. Is it merely coincidence that the divided Congress during the Reagan Administration a quarter century ago featured a Republican Senate and Democratic House, while in both instances this decade the situation has been the inverse? No, it’s not. In fact, there is demonstrable evidence of a gradual “House-ification” of the national Republican Party since the mid-1980s, a trend with important implications for contemporary politics and policy in Washington, as well as the 2012 Republican presidential primary. Whether a party holds the majority in neither, one, or both chambers of Congress at some point in time is only a crude indication of that party’s bicameral balance. A better measure of what I call bicameral party strength is a party’s ratio of House seats to Senate seats. Because the respective chamber totals are presently 435 and 100, whenever the ratio exceeds 4.35-to-1, that party’s congressional delegation can be said to be “House-heavy,” and vice versa. The bigger the divergence from that baseline in either direction, the more tilted the party’s representation in Congress is toward one chamber or the other. Computed for every two-year Congress from the start of Dwight Eisenhower’s presidency to the present (and adjusted for Alaska and Hawaii’s admittance as states in 1959), Figure 1 depicts the Republicans’ bicameral party strength ratio. Notice the figure’s V-shape. Beginning with the late Eisenhower and early Kennedy years, the Republican Party gradually became a more Senate-heavy party, bottoming out during the middle of the aforementioned six-year period at the start of the Reagan era, when the Howard Baker-led Republicans controlled the Senate, Tip O’Neill’s Democrats commanded the other side of the Capitol, and the ratio fell to just 3.07 GOP representatives for every senator. Since the mid-1980s, however, the Republicans have steadily become a more House-heavy congressional delegation. Following the 2010 election, the bicameral tilt is approaching historic highs. In fact, the 5.14 House-to-Senate tilt for the GOP today is greater than for all but six Congresses since the party’s founding. In all six prior cases, however, one party controlled both chambers of Congress, thereby muting or even mooting the disparities because Republicans either controlled none or both chambers. 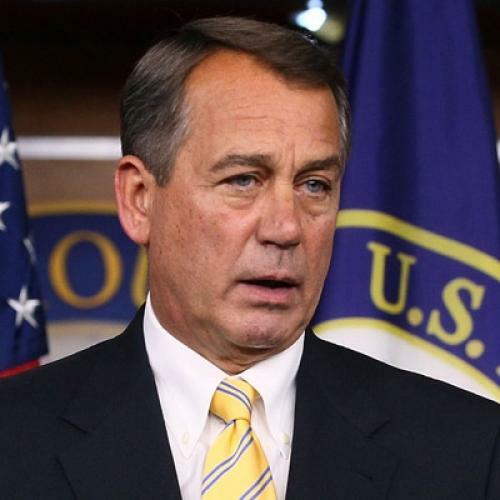 Speaker John Boehner, for his part, leads a House-heavy Republican Party that controls only the House. His is arguably the GOP’s most House-dominant coalition in the party’s 158-year existence. So how did the modern GOP become so House-ified? The conventional, lazy answer to this question is that Republicans lurched too far right. Though it’s true the GOP has moved rightward since the Reagan era, what’s unclear is whether the Republicans became more House-dominant because they moved right or moved right because they became more House-dominant. On the one hand, a shift in the GOP stance towards redistricting allowed more solid conservatives to be elected to the House and subsequently moved the party to the right. In the early 1980s, House Republicans voted overwhelmingly to oppose race-based redistricting. But by the time of the 1990 Census, Republicans had reversed course; they realized they could forge a strategic alliance with minority politicians to create majority-minority districts that would elect more black and Latino Democrats but also more Republicans, because heavily-Democratic minority voters would be packed inefficiently into fewer districts. This plan succeeded electorally, but also deterred House Republicans from building the sort of cross-racial coalitions needed to win—especially in statewide contests for Senate seats or electoral college votes—in an increasingly non-white nation. On the other hand, a series of GOP litmus tests that began to develop in the early 1980s made the party more reliably conservative, making it harder for candidates to win statewide office. Whether on abortion or tax policy, affirmative action or de-regulation, these new litmus tests helped to purify and homogenize the Republican Party’s coalition—just as the Democrats’ congressional wing and its affiliated identity groups had done during the 1960s and 1970s. This transformation was not driven entirely by the party’s House wing. But with its close connections to the grassroots social conservatives and K Street corporate insiders, a generation of prominent, whip-cracking House Republicans including Tom DeLay, Henry Hyde, and Trent Lott helped to enforce partisan purity. For House members running in safe districts where motivated conservatives largely decide who wins the primary, litmus testing rarely presents a problem and often ensures re-election. But in Senate contests (think Christine O’Donnell or Sharron Angle in 2010), expecting candidates to satisfy litmus tests can be costly. Second, House leaders will exert unusual command over the Republican platform and policy agenda. Evidence for such control is as clear as the sky blue eyes of Wisconsin Representative Paul Ryan, who has emerged as the GOP’s de facto national policy leader. Ryan’s budget plan is the starting point for all budget discussions among national Republicans—and the sharp point of the political spear for those who dare oppose it. (Just ask Newt Gingrich.) This rising House influence over Republican policy is hardly new, but it’s growing; its contemporary origins date back to the convention platform fights of the late 1980s and early 1990s, when the Gingrich-led “young turks” first began to flex their political muscle. It’s no coincidence that during the Reagan years the Democrats—then the more parochial, entrenched, and identity group-oriented party—held onto the House despite losing the Senate. Nor is the present, reverse situation on Capitol Hill a coincidence. Until the GOP finds a way to free itself from the political and policy grip of its dominant House wing, Republicans will continue to underperform in statewide and national elections. Thomas F. Schaller is a professor of political science at UMBC and a columnist for the Baltimore Sun. His book on the Republican Party since Reagan will be published by Yale University Press in 2012.